The parish of Geldeston is right on the Norfolk and Suffolk border, about ten miles southwest of Great Yarmouth, its southern boundary defined by the River Waveney. The name comes from the Old English for ‘Gyldi’s enclosure’, but while the neighbouring parishes of Ellingham and Gillingham are mentioned in the Domesday Book of 1086, Geldeston first appears in documentary records somewhat later, in 1242. The earliest evidence of human activity in the parish comes in the form of a Palaeolithic flint axe (NHER 17559) found on land opposite the pub. Palaeolithic or possibly Mesolithic flint blades have also been found (NHER 10728), and some Neolithic tools (NHER 10663 and 10729), including a couple of polished axes (NHER 10664 and 10665), but generally there is little concentrated evidence from these very early periods for any sustained activity. Similarly, the Bronze Age has so far yielded only part of a copper alloy spearhead (NHER 29779) and two decorative gold strips (NHER 42792), discovered in 1777 during the construction of Geldeston Hall (see below). The Iron Age in Geldeston thus far is represented by a single harness fitting (NHER 20869). 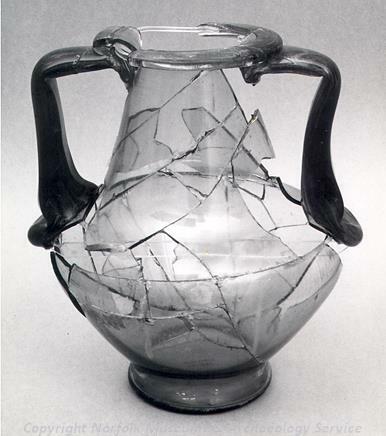 A Roman green glass vessel that was used to contain an infant cremation. The burial was found in Geldestone. The period of the Roman occupation following on from the Iron Age has left the parish with its first, if very tentative, evidence of structures. A cremation burial was discovered in 1849, consisting of a green glass vase containing the remains of an infant together with a coin and a casket mount (NHER 10667) A supposed Roman military camp (NHER 10734) was noted on old Ordnance Survey maps, but there is no further evidence of its existence. Lastly, an earthwork running through Geldeston Hall park has been interpreted as part of a Roman road (NHER 20179), though it could be a medieval boundary bank, or even the former reused as the latter. However, Roman coins have been found (NHER 25025, 30116 and 30951), as has a copper alloy strap end (NHER 20356). Finds from the Saxon period consist of two Late Saxon brooches (NHER 40857 and 40858). A hoard of fifty one Late Saxon coins (NHER 22467) was found in 1986, but whilst a fascinating and unusual find, it was probably recovered from river dredgings, and so its exact provenance is not certain. The medieval period following the Norman Conquest has left the parish with its earliest surviving building, the church of St Michael and All Angels (NHER 10669). The oldest part of the church is its 12th century round tower, the rest of the building being 14th and 15th century, much remodelled and restored in the late 19th century. A 15th century font can be found inside, and the churchyard has some attractive gravestones. Other medieval buildings have not survived, but have left a footprint in the form of their surrounding moat. An example of this is NHER 32989, where all traces of the medieval building have disappeared, but faint traces of its moat can be seen both from the air and on the ground. Some medieval buildings do survive as fragments of later rebuilds. For example, of the pair of cottages known as Rush Fen and Chilverton Cottages (NHER 12663), Chilverton Cottage is 17th century, but Rush Fen is probably the remaining bay of a medieval aisled hall, later encased in brick and today having a 20th century exterior. Medieval small finds found in the parish so far include a pilgrim bottle found in the 19th century (NHER 17129), pottery fragments (NHER 10670, 10687, 10689, 11535 and 12449), coins (NHER 25025 and 30116) and a lead weight (NHER 40857). Probably the oldest building to survive from the earlier post medieval period is Green Farm Barn (NHER 12662), a large 17th century thatched timber framed barn with weatherboarded sides, now thought to have been converted. Also 17th century (with later alterations) is Manor House Farmhouse (NHER 30688). The largest house from the 18th century is Geldeston Hall (NHER 10666), a grey and red brick hall built in 1777, and home to the Kerrich family until 1930. Old House (NHER 12673) is also 18th century (and parts are possibly earlier), with a long serpentine wall along its roadside boundary. Jock’s Lodge (NHER 28465) is of the same century, with a 19th century façade and a later extension to the left. Away from buildings, there is a preserved post medieval saw pit at NHER 17559, and Geldeston Dyke (NHER 40095), a probably 18th century artificial waterway, made to connect the village with the River Waveney. It was updated in the 20th century after the closure of the railway. Piet Aldridge (NLA), 4 April 2006.